As the vlog class of 2004 becomes more immersed in the videoblogging field, space is left for later classes to step up. 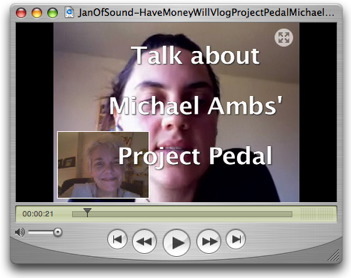 When Ryanne Hodson’s busy-ness gap occurred in the midst of advocating Michael Ambs’ Project Pedal, I stepped up with Road Node 101-inspired glee. Project Pedal is the essential 2nd millennial road trip. Human powered in every way, starting June 2, 2007, Ambs will follow and document the two-wheeled road trip magic of subjects Larry and Jay as they undertake a cross-country bicycle journey. Michael arrived at Have Money Will Vlog having lost support from a classic documentary film organization. It seemed to me he came to us despairing of accomplishing his dream film in the way he’d dreamed it. The production issues Michael and I spoke about were geared toward helping him embrace the one-human-band videoblogging makes possible. Michael is at heart a classic film maker, so it is fitting for him to have won the $25,000 first prize in Network2.tv’s promo contest that now supports his efforts. With this award, Ambs will be able to make the documentary vlog / film he imagined. My points here are to encourage the less-tangible promotional support of our estimable community, to wish Ambs and his team well, and to say to others out there who may despair of making the documentaries or feature-length vlogs of their own dreams, that one does not have to have $25K or $10K or $5K to accomplish this. 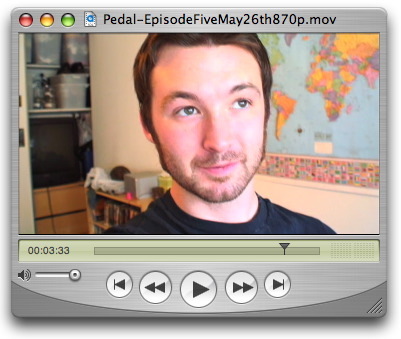 One may make a feature-length film in vlog bits and pieces with a cell phone or video-capable digital still camera. And that’s the space where and why HMWV lives. Bon Voyage to Michael Ambs and Project Pedal. We’ll be watching and cheering you on every turn of the way. Six years ago, when I was 19, I climbed on a bicycle - loaded with 50 pounds of gear that made it hilariously difficult to ride a straight line - and, along with two friends, left on a 4,200 mile ride towards the Golden Gate bridge. Those two months had a surprisingly profound effect on the way I looked at myself, at others and at the world around me. We are all capable of far more then we’ll ever give ourselves credit for - that is something I saw over and over again through chance encounters with other people on the road. People of all ages, all backgrounds… each “out there” for their own reasons. I hope you’ll watch as we follow two bicyclist, Larry and Jay, starting in Anacortes, Washington and ending in Bar Harbor, Maine - documenting the inspiring people who cross their path. We are so excited that Lives in Focus is fully funded. Our highest amount raised so far! Thanks to everyone who contributed and spread the word. Required by: March 7, 2007 FUNDED!! Lives in Focus is vlogging the impact on family relations and dynamics when one or more member of a family is incarcerated. How do some families overcome the separation, financial strain, social stigma and guilt while others crumble? Why is there a greater likelihood that a child of someone who is in prison will also end up in jail at some point? How do society, politics or special interests help or hinder family relations? I plan to post a video about three minutes in length that focuses on a particular theme showcased through a family’s life. How do such obstacles impact the relationship between a parent and child (both the parent who remains at home and the one in prison)? Between husband and wife? Between siblings? Is there anticipation or dread or tedium at the thought of the long hike on visiting day? How are family relations re-established when a prisoner is released? What are the unforeseen consequences of being released? What efforts do inmates make to stay in touch from within prison walls? 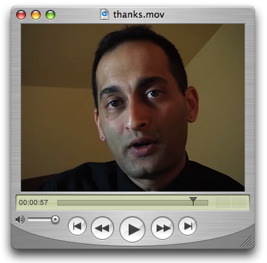 These short, thematic vlogs will show people in their daily lives with relevant audio from interviews. I plan to post on a regular once-a-week schedule for 3 to 6 months. I also plan to loan video cameras to a few families we select. Lives in Focus has already agreed to set up workshops in conjunction with Prison Families of New York to train these families to document their own lives. We will edit this material and post it to the vlog, giving credit to the families. The videos will be available to the public for free for non-commerical use with a Creative Commons copyright. Lives in Focus is NOT questioning the guilty verdict that sent people to prison. We also recognize that many crimes upset the lives of others–in extreme cases even depriving families of their own loved ones. Lives in Focus believes, however, that it is important to document and be aware of the repercussions that imprisonment has on an inmate’s family, a large and growing population in America. As an award-winning journalist who wrote frequently for the New York Times and as a journalism professor at the City University of New York’s Graduate School of Journalism, I have already gained access to prisoners and their families. I have a strong track record working with people who are often ostracized by society. The previous Lives in Focus project, shot in 2005, documented the lives of men, women and children in India who are HIV+ or have AIDS. I met Sandeep when he wrote an NY Times article on Videoblogging back in 2005. It was the first time a journalist really seemed to respect what we were doing in the Videoblogging Community. We weren’t just people making funny viral videos, but actually had the ability to make videos of consequence. He ended up starting his own videoblog, Lives in Focus, helping set the example of what we can do with this new medium without boundaries. Any ambitious project needs some money to get started, so help fund the work we want to see. Thanks to so many for this wonderful showing of community support. I know that the Lost In Light website will be a great resource for many. Please continue to show your support for this great project by telling your friends and family with 8mm film stocks to look into this great service when it starts up next year. In the meantime, visit the site and watch the content grow as Jennifer Proctor, Arron Valdez and others contribute content around small gauge film-making. Remember 8mm? It’s alive and well at Lost In Light. Required by: November 20, 2006 FUNDED!! This is a project about the 8mm film format. But 8mm is dead, you say? On the contrary! Not only is the format alive with innovation by filmmakers around the world, but hours and hours of Super 8 and regular 8mm film exist in attics and basements the world over—as home movies, educational films, works of art—that is slowly fading from the historical record. We’re here to preserve that record before these films are lost, and to make those films available for viewing by the public and for use by artists seeking new, compelling footage. Lost in Light is a project devoted to preserving, showcasing, and celebrating films created on the small-gauge 8mm film format. Commons licenses. 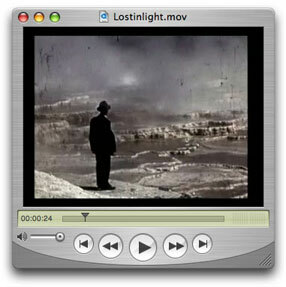 In addition, Lost in Light will include articles and features by members of the filmmaking and film preservation communities, video tutorials for making 8mm films, as well as creative work, all with the goal of preserving and championing this important film format. The site will have a soft launch with some content as soon as funding is available, with a full, hard launch set for January 2007. Join us on this exciting visual journey through time and creativity! I recently came across some old amusement park footage. It was a joy to discover. As a child, I had played at that very same seaside fun zone. The video triggered the recollection of so many memories that had somehow become buried over time. Without these archives, I can’t imagine how I would have ever recalled so many important details. It was truly a wonderful and astounding experience. When Jen Proctor and Aaron Valdez first proposed their Lost In Light project, I immediately fell in love with the idea. Perhaps it’s because much of my own childhood was captured on 8MM. Perhaps it is the voyeuristic thrill of experiencing “other people’s memories” and a sense of “time travel”. Perhaps it is the community aspects around film preservation. I just know that I love it and hope you will support this fine project that aims to both educate and preserve. As Maria’s advocate for this round of funding through Have Money Will Vlog, I’m amazed and proud of what can be accomplished by aggregated support from a network of regular people. Maria’s independent documentary project has been funded by the people who believe it’s interesting and important. Nobody had to drain their bank account. Nobody had to cut any deals with a corporation. And those of us tired of wasting money on an endlessly disappointing monthly cable bill have found another way to make personal media happen. THANK YOU to everyone who donated! 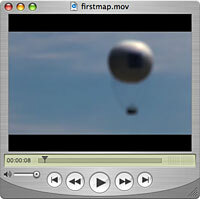 Keep your eye on the videoblogging projects we promote through this site. We think you’ll find other ways to support the ongoing transformation of the world’s media conversation. 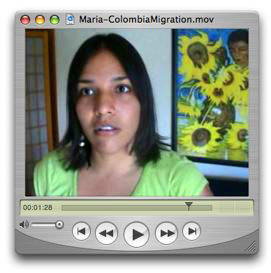 Subscribe to Colombia Migration Project. Required by: October 16, 2006 FUNDED!! Economic crisis and globalization are putting unprecedented pressure on the lives of people in Colombia. Ten percent of the population have emigrated, many to the United States. Maria Gomez, a Colombian resident of New York City, has begun a video documentary project interviewing other Colombian people affected by this period of social upheaval and change. Maria, who is trained in ethnographic data collection for anthropological research, has already interviewed many in the Colombian immigrant community of New York. She needs financial backing for a 4 month trip through Colombia gathering the stories of those still waiting to make the journey North. Maria has valuable personal connections with this subject matter, and she’s very good at the kind of interviewing a project like this requires. She’s passionate about doing well, and I’m excited to see it be a success. This is a chance to document and distribute the voices of people dramatically affected by complex social forces. We are thrilled to say that The Sustainable Route was funded in the record time of 8 days! Ashley and Megan will be hitting the road on the second to last weekend in September to attend the Common Ground Fair in Unity, Maine. 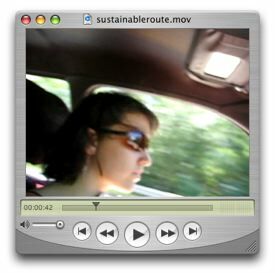 Check out SustainableRoute.com and Subscribe to keep track of their 4 month tour of sustainable projects throughout the USA. Leave Suggestions on the Discussion Page and Check out the Wiki of places already suggested. Did you miss out on donating? Throw Ashley and Megan a dime through the Paypal button on their sidebar. Thanks to all who donated! Required by: September 12, 2006 FUNDED!! What do you mean, sustainable? Good question. The Sustainable Route will document the continuing exploration of the ’sustainable’ movement. Megan and I are recent Bennington College graduates with self-designed degrees in Visual Arts and Environmental Studies. We decided to take a road trip and visit different places around the country where average people are grappling with pending doom; ie global climate change, increasing populations, peak oil, threats to biodiversity, etc. There is a lot to chew on these days when it comes to making simple decisions. Where is our food coming from, how do we get electricity, what is the impact of our lifestyles on the world around us? What are average people, like ourselves, doing in their communities to define and work towards ’sustainability’? Come with us as we travel along and seek out the crest of this green wave! Go to sustainableroute.com to add suggestions of projects and places to visit. First, we love Ashley because she’s Ryanne’s sister. She has been doing great vlogging work since 2005 (Common Courtesy vlog). Not only has she been creating, she teaches and inspires others around her (Rusted Gate vlog, Make A Difference vlog) We also love her project: drive around the country for 4 months(!) and make a video exploring every place she visits. Suggestions of sustainable projects to visit will be coming straight from the community. At the end, we’ll have an awesome scrapbook of what sustainablity looks like through individuals living and working in the United States. A portion of the money raised will be donated to a carbon offset program, like Carbonfund.org, in order to help reduce the ecological footprint her traveling will create. Daniel will be posting a video a day for the next week based on “restrictions” that this community helped create (http://sevenmaps.pbwiki.com/). Each night, an assignment will be posted to the Seven Maps site and the following evening a video will be posted. This is real-time game. Yesterday Daniel had problems with his camera. So now that’s been thrown into the mix. See how he deals with it. Head on over to the site and get int he game.